We are excited to announce the Beta launch of Norton Identity Safe Standalone. Norton Identity Safe takes away the pain of having to remember multiple passwords and securely stores important information such as credit cards numbers, addresses, and phone numbers. Please visit https://identitysafe-beta.norton.com/ to try the Beta. Passwords have become a way of life for every computer user. They are one of the most popular methods of user authentication on the Internet. They are used to check emails, access bank accounts, watch movies, play games, and a lot more. The world would be lot simpler if we could safely use the exact same password across all Web sites. Unfortunately with the rise of phishing attacks, having a single password is very dangerous. In a phishing attack, a fake Web site can impersonate your email provider. If you provide your password thinking that it’s business as usual, you have just given your email password to a hacker . If that password is also your bank password it can be used tocause financial damage. Another way hackers get your passwords is to use a lot of computing power to guess it--a brute force method of trying out various combinations of letters and numbers. Web sites that realize these risks have deployed measures to protect their users from such attacks. The use of a strong password is encouraged, and is in some cases mandatory. Typically Web sites define strong passwords as having a certain length and a mix of upper- and lowercase letters and special characters. Some Web sites force users to change their passwords on a periodic basis. A few deploy methods where you have to select a picture that you recognize, so that you can ensure you are really on the correct Web site. These are very good measures that help protect their users. The challenge with such efforts is there are no standards rules across Web sites. Users are left with trying to figure out how to cope with the variety of rules and may feel forced to take a few shortcuts, like using the same strong password on several Web sites. Another challenge with strong passwords is actually remembering them. Lots of users actually write down the passwords on a sticky note and keep it around their computers for easy access. This obviously is not a safe practice, but is understandable. At Norton we have been helping users solve this exact challenge with our Norton Identity Safe feature. Users of Norton Internet Security and Norton 360 have been using this feature on their PCs to keep their passwords and identity safe. With the introduction of the standalone version of Norton Identity Safe, we are not only providing a way to access your securely stored passwords and personal information from any computer, but are providing a means to do so from your tablets and mobile phones. The mission of Norton Identity Safe is to travel with you and continuously remember complicated passwords whenever and wherever you need them. As you are browsing the Internet on your PC, tablet, or mobile phone, Norton Identity Safe will automatically fill in your user name and password to log you in to your email, bank, etc. Here are few details of how Norton Identity Safe works internally. On a PC, browser plugins/extensions for Internet Explorer, Firefox and Chrome are installed. This browser presence allows Identity Safe to see what website users go to & help fill the passwords automatically. When a user logs into a website for first time after installing Norton Identity Safe, these plugins/extensions detect that and prompt the user to save the login information into the database (aka vault). Mobile Apps are able to download the vault and make them available to the users. In the current incarnation, Mobile Apps will not beable to capture any new logins. You need to setup the product on a PC and then use the product on Mobile Apps. The vault is a database where all your passwords and confidential information and notes are securely stored. With Norton Identity Safe Standalone, your vault is created in the cloud and automatically made available on mobile devices. Once you have a vault created, you have password freedom. Getting password freedom starts with installing NortonIdentity Safe on your PC and creating a vault. 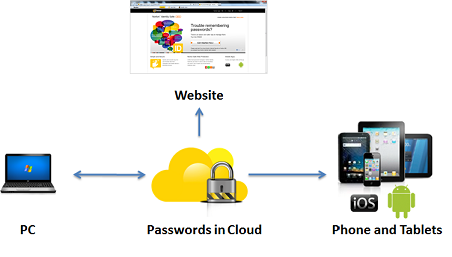 It’s a simple process of providing a Norton Account and creating a strong password for access to your stored passwords. 1. Download the PC software from https://identitysafe-beta.norton.com/ and start the Install. 2. Provide the email address you use for your Norton Account. If you don’t have a Norton Account, enter the email address you want to use to create one. a. If you already have Norton Account, the installer will ask for your password. b. If you don’t have a Norton Account, to the installer will provide a screen where you can create one. 3. Create a strong vault password. A simple list shows if you have met the criteria. 1. User visits gmail.com on a PC and provides a user name and password. 2. Norton Identity Safe asks the user if they want to save the user name and password for gmail.com. 3. If the user says Yes, Norton Identity Safe saves them securely in the vault. 4. The next time the user goes to gmail.com, Norton Identity Safe fills in the user name and password for gmail.com automatically. 5. The user never has to remember their gmail.com login again. Once you are have your passwords saved by Norton Identity Safe, you can fully realize the convenience it provides when you browse on your mobile devices. Norton Identity Safe provides an App for the Apple iPhone and iPad as well as for Android phones and tablets. All you have to do is download them from the Apple or Android App store and set them up using thesame account you used on your PC. This links the App with the vault that you have created and immediately downloads all the passwords to your mobile device. You can start using them without typing a single additional password. Say you are visiting a friend and you need to check your emails; you are not carrying a device that has Norton Identity Safe installed on it. No reason to worry because Norton Identity Safe travels with you. All you have to do is log on to https://identitysafe-beta.norton.com/ and you will be able to access your passwords. 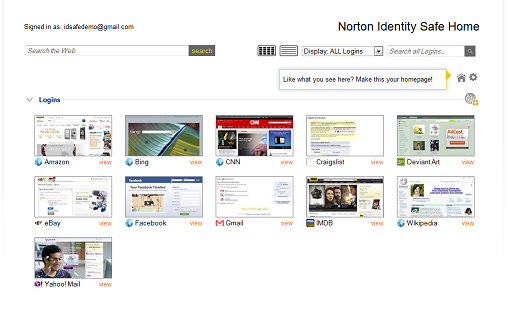 Your Norton Identity Safe home page is where all of your logins, cards, and notes are visually represented. It’s a good place to see what you have saved and change any settings to the product. It’s recommended that you set this as your browser’s home page so that your logins are readily available every time you open the browser. If you choose not to make it your homepage, it can be easily accessed from the Norton Toolbar menu. Additionally, the home page has quick links to get to the sites from which you can download the mobile Apps. It’s highly recommended that you download these Apps if you own an iPhone, iPad, or Android device. 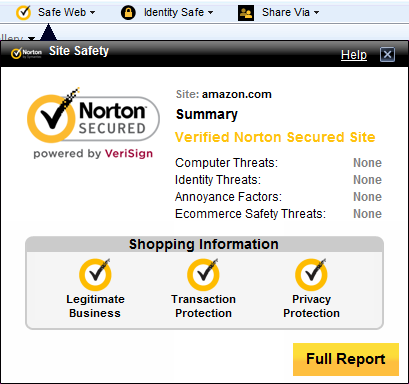 Norton Identity Safe also includes Safe Web--a feature that protects you from going to malicious Web sites. As you are browsing, it shows you whether the Web site is safe or not. This protects you from phishing attacks and Web sites that might be trying to steal your passwords. iOS and Android Apps provide a full blown browser. It provides a safe browsing environment making sure users are protected from malicious websites and makes sure that the search results show the safety rating so users know if a site is bad even before they visit it. If you share URLs, you can use Share Via to do so with the confidence that you are not accidently sharing something with your friends and family that will potentially infect their computers. With one click you canshare a Web site via popular social networks and email providers right from the toolbar. Norton Internet Security 2012 customers have access to the cloud-based Norton Identity Safe and which means you already have the PC client of Norton Identity Safe already installed. If you do not have the 2012 version installed, you can download it from http://updatecenter.norton.com/ManualUpdate/Index?&NUCSID=2&NUCVER=2011. You can immediately take advantage of the mobile Apps and access all the logins that you saved on your PC from your mobile devices. We are looking forward to your feedback. You can post it on the Norton Forum. You can download the product from https://identitysafe-beta.norton.com/. Will this product also be available for OS x Mac's running Lion? We are working towards a solution for Mac as well. Will keep the thread updated as we go.